Les Echos is not an entirely terrible newspaper, or at least it wasn’t always the case (ownership has changed). It didn’t refuse to cover some important stories, such as this scoop about Microsoft lobbying French politicians for OOXML. When Les Echos covers the EPO it involves defending the EPO from perceived critics like a judge who said the truth about Željko Topić. We are once again seeing Les Echos carrying water for Battistelli. Battistelli is undoubtedly an amazing president. It is amazing that he gets to keep his job (for now) after all these scandals at the EPO, including him breaking laws and his refusal to obey court rulings against him. Only a vain elitist would be capable of defending ones like Battistelli and considering the new ownership of Les Echos, it all seems to make sense. “So it turns out that the EPO is now censoring newspapers, or that the newspapers are self-censoring for fear of the EPO’s thugs.”A reader has told us about the “European Inventor of the Year Award,” an article from the 11th of June, 2015. “The report of the European Inventor of the Year Award,” says the reader, “which took place in Paris on 11 June 2015, might be of interest. “It seems that the party was spoiled for Battistelli by the French State Secretary for Digital Economy, Axelle Lemaire who made some comments expressing the French government’s concern about the ongoing social conflict at the EPO. June 11th, 2015 was the day of THE party. Not the excellent Blake Edward’s 1968 film with Peter Sellers but Mr Battistelli’s lifetime’s achievement in the somptuous Palais Brogniart in Paris. The moderator paid him “the gracious Benoît Battistelli”… Etat de grâce? Well not quite. 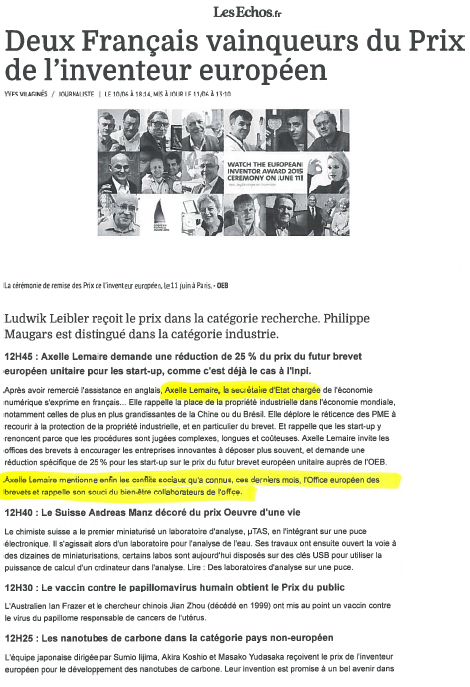 First, according to sources among the organisers, Mr Battistelli did not want Ms Lemaire to speak but simply to hand out an award. Obviously, she refused. In her speech , she never mentioned the name of Mr Battistelli and dared to mention “the social conflict in the EPO and her concerns for the rights of EPO staff”. Bravo Madame! Colleagues of the EPO, who have a long tradition and solid expertise of finding quickly pertinent information found it (click here ) – just before the publication was censored (click here ) to suppress this “affront” to Mr Battistelli. Reliable insiders reported that at the end of the ceremony Ms Bergot (PD 43) rushed to the State Secretary to complain about her attitude, boldly stating that the Secretary had no idea how many great things were done at the EPO lately. The tone was such that Ms Lemaire had to remind Ms Bergot that she was addressing an official representative of France. Finally, no one had the courtesy to bid farewell to Ms Lemaire. Un malheur n’arrivant jamais seul, in the “Huffington Post” (partly owned by “Le Monde”), three members of the French Parliament, three members of the French Senate, and a Member of the European Parliament published a tribune titled L’Organisation européenne des brevets, une zone de non droit en Europe? which reports on the troubled social situation at the EPO. If one considers that according to members of top management speaking to us on confidential basis, about 2 Mio EUR of applicants’ money were spent (wasted?) this year for this “event”, we hope that the lunch served was at least good. So it turns out that the EPO is now censoring newspapers, or that the newspapers are self-censoring for fear of the EPO’s thugs. Don’t forget that Željko Topić, Battistelli’s key thug, took people to court (costing them a fortune using highly notorious SLAPP), claiming “defamation” only to lose the case at the end, and not even pay for emotional damage, stress, etc. It’s an effective intimidation tactic — illegal in some US states — that ultimately results in deletionism (out of nervousness and terror). Another censorship scandal from a supposedly scientific institution? Thankfully we received some enormously valuable information, including snapshots, showing Battistelli’s special treatment in the French media. This guy is a never-ending scandal. Les Echos belongs to the French luxury goods conglomerate LVMH (Louis Vuitton – Moët Hennessy). In the past, Les Echos has published the occasional “puff piece” about Battistelli and his role as President of the EPO. Update: “In the mean time,” quite fortunately and in a very timely fashion, “IPKat has covered this incident” (to paraphrase a reader). According to this, European taxpayers’ money is wasted not only on self-glamourising events for the EPO’s public image but also media distortion, or yet more paid ‘placements’ (corrupting the media). Les Echos journalists wrongly assumed that they were in the business of journalism and attended the event to give fair coverage. Not so! Not allowed! Wow! The EPO is once again paying big and influential newspapers to produce fake ‘coverage’. What a misuse of public money. This means that Les Echos has effectively been reduced to articles for sale. The stakeholders even get to shape these articles as they see fit (post-publication). Guest Article: Is the EPO Deliberately Disseminating “False Facts” About Benoît Battistelli’s Political Activities in Saint-Germain-en-Laye?